Today we’re going to take a look at beekeeping gloves. One of the things that I get asked on a fairly regular basis is what type of bee gloves I use. I thought today we’d take a good look at the different types of beekeeping gloves that are out there and that are available for you and the reasons why some are perhaps better suited to beginner beekeepers or to more advanced beekeepers and the kind of thing that you can expect. I’ll tell you a useful tip at the end when you’re dealing with a particularly fractious aggressive colony. So, you’ve just bought your hives, you’ve got your bee suit and all the beekeeping tools that you need. You’re about to take ownership of a nucleus colony of bees and you think “Right, I need some bee gloves”. If you look at all the websites and check out all the various sellers that are out there there’s a whole range of different types of gloves that you can get from the very thin nitrile style of gloves right up to the heavy-duty beekeeping leather gloves. Main types of bee gloves, that I’m going to tell you about, are leather beekeeping gloves anв rubber (nitrile) bee gloves. In turn, each category divide on dense and thick. 1. Heavy-duty beekeeping gloves – for beginner beekeepers or allergic to bees. 2. Leather beekeeping gloves – most recommended beekeeping gloves for practicing beekeepers. 4. Nitrile gloves – for practicing and experienced beekeepers. These are my subjective categories, it is understood that, for example, beginners can use nitrile gloves, or not use gloves at all. I simply consider it basing on my many years of beekeeping experience and communication with beekeepers. 1.3 Cow leather or Goatskin? Best sting-proof gloves. When you put it on you’ve got the glove and then you’ve got the gauntlet that goes up and over your bee suit. These are going to give you the maximum protection and you’re not going to get stung through the leather material. That’s great if you suffer from allergic reactions or that you know that you’re likely to have an allergic reaction. Then using something like a leather gauntlet is going to give you absolutely the maximum amount of protection, the bees are not going to sting through this. First is you can’t really feel anything through the gloves. Although you have protection when you’re holding on to frames, beehives, all of the accessories you can’t really feel if you’ve got bees on your hands. This tends to be more crushing of bees purely by accident because you can’t actually physically feel when you’ve got bees on your hands and that could be a real problem. The second issue and possibly an even more concerning issue is that with gauntlets. They’re going to get dirty as soon as you open up a hive these gauntlets are going to get covered in propolis. You’re going to inevitably squash bees. Regardless of which gloves you have, there is the risk that you may spread disease between your colonies. One of the ways that you might be able to avoid that is by washing the gloves in washing soda between inspections. But that’s going to make them wet. When the leather gets wet it becomes slippery and then there’s a risk that you could end up dropping frames of bees or dropping brood boxes or supers. When you first start beekeeping these might be the type of glove that you would go for and it’s a leather glove. For example, the best choice, as for me, is this one is cow leather it’s from Humble Bee. It’s made up of a leather glove with a heavy–duty canvas cloth gauntlet and it’s elasticated at the end. Can bees sting through leather? I’ve never faced this problem during all the years of beekeeping practice. The only way the bee sting was when gauntlets were not fit tightly and the bee flew underneath. You might think that that’s the best glove to go for. But it might not necessarily be the case. I want to explain why so. For a lot of beginners, one of the potential hurdles to get over is being stung. Particularly on or around the hands and the wrists. So there’s a temptation to get your bee suit and then to go out and buy something like a heavy-duty pair of gauntlet style gloves. But there are two real problems with these leather gloves. As for me, this is the most reliable wasp proof gloves. Bee venom only in reasonable quantities beneficial to health. When a beekeeper serves many hives or simply saves his time, he has no time to be distracted. And when the bees sting, the beekeeper must continue to perform the tasks. In beekeeping use, different means to protect the hands but they all have their drawbacks. Some are very thin and the sting of a bee reaches the hands of the beekeeper; others are too dense and working their hands become wet. The professional heavy-duty bee gloves radically change the view on hand protection. The soft and thin skin used in gloves allows you to feel all the touches with your fingers and perform even precise work in gloves without being distracted by anything. Over the entire surface of the gloves (fingers, palms) there are small and almost invisible vents that increase the ventilation of the air and eliminate sweating of hands. Especially well gloves demonstrate their professional properties in hot weather. The sleeves are made of thick fabric. Flax gives air access, and its density reliably protects the beekeeper’s hands. On the armbands sewn gum for the secure fit. For many practicing beekeepers, reliable hand protection and work comfort are important. Especially in professional and industrial beekeeping without sting protection, they work extremely rarely. Professional leather beekeeping gloves let the air through, which makes it possible for the hands not to sweat as in rubber gloves. Made of natural materials. Soft leather is very comfortable to sit on hands and does not constrain movement, long cotton sleeves serve as additional protection and securely fixed on the hand. The paws have a rubber band to fit snugly to the hand and provide maximum protection. Therefore, it is convenient to work in gloves, while feeling completely carefree. Leather gloves come in a range of different styles. You can have them with mesh gauntlets, some ventilation in them etc. But overall I find them a little bit too cumbersome. In my mind, they’re really only designed for somebody who knows or thinks that they may suffer from an allergic reaction and need that extra protection because they can’t allow themselves to be stung. Anyway, ventilated beekeeping gloves are the most popular solution for beginning beekeepers. Cow leather (on the left) is durable leather, it has a pleasant natural texture, wear-resistant. Goatskin (on the right) is delicate and soft, very thin and durable, has a unique undulating pattern, is sufficiently water resistant (it’s important), flexible and elastic. Goat leather is more lightweight than cow leather. Firstly, you should remember, that there are no special disposable gloves for beekeeping. Only leather ones are really sting proof beekeeping gloves. So here are two different types of rubber beekeeping gloves. I’ve used them both and the important thing is to get the long cuff version. 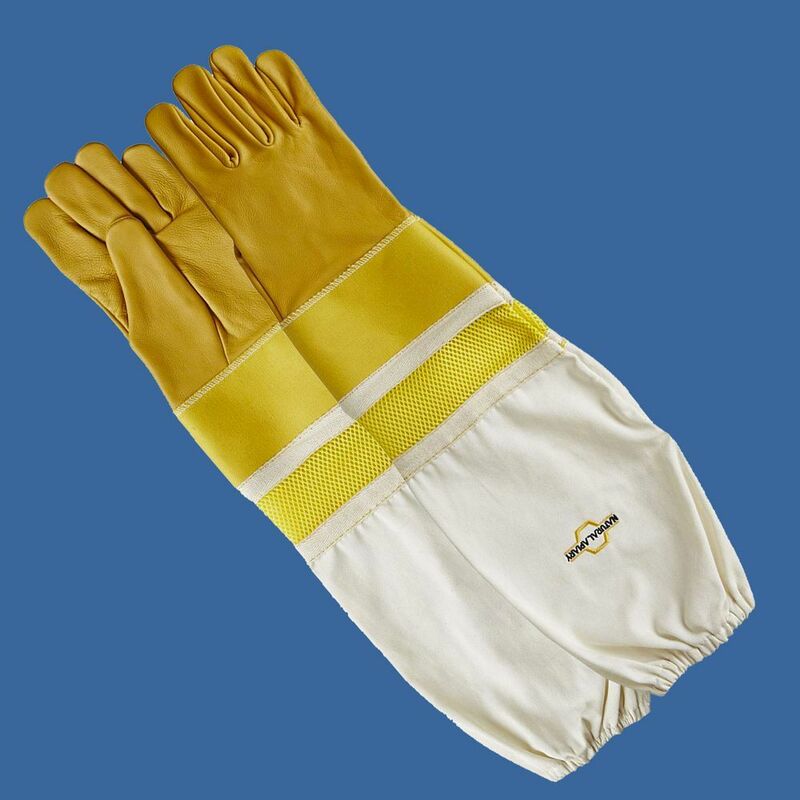 If you just buy nitrile beekeeping gloves – most of them tend to be short cuff. But if you buy the long cuff version you can pull that over your bee suit. Then if you wear the beekeeping gauntlets across the cuff and onto the bee suit then you’re going to be perfectly well protected and you won’t have any problems with bees getting underneath the cuff and getting trapped and then stinging it. The bees can still sting through – they won’t give you total protection, but they allow you to keep your hands nice and clean. So that you’re not getting really messy in between hives and that for me it is the important point. I tend to use washing soda to clean my hive tools in between hive inspections and what I don’t want is to be continually putting my hands into washing soda and suffer the effects of having your hands in water being wet covered in washing soda a day in day out over the course of a season. I would much rather wear some thin nitrile gloves and make sure that my hands are kept protected from having to wash them. I don’t mind the occasional sting – I’m quite happy to part with being stung. But with these, I get that protection and you can actually feel if a bee is on the glove and is trying to sting you. So you can then take action by just brushing them off and moving away from the hive if you need to before they do their deed. Сost. 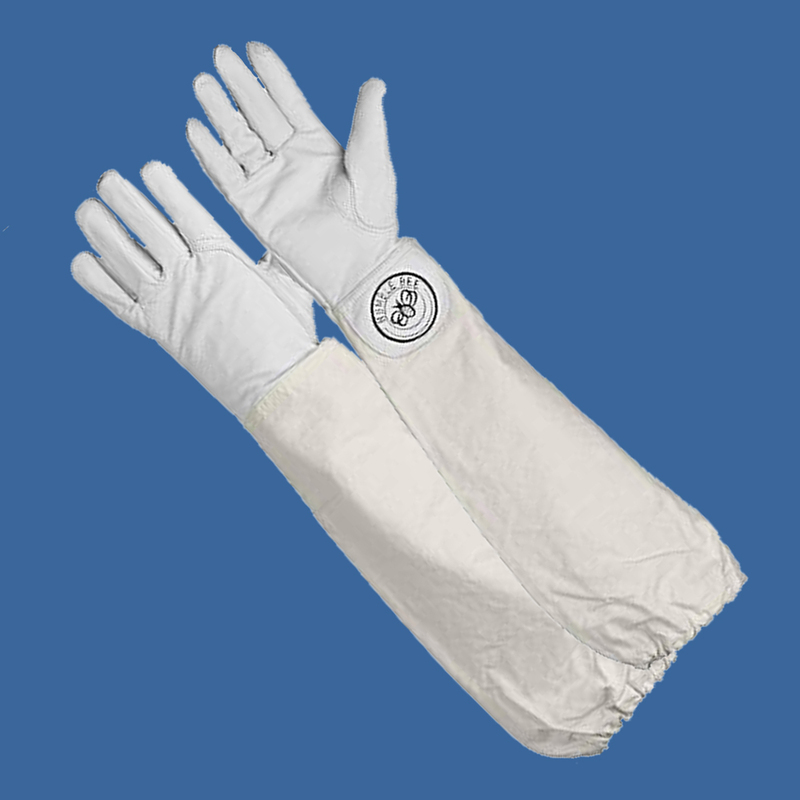 Disposable gloves do not mind throw immediately after use, and reusable can also be changed quite often. Hive hygiene. Gloves can be changed easily after inspection of the hive. Especially relevant if you have a lot of hives, or you inspect the hives of other beekeepers. 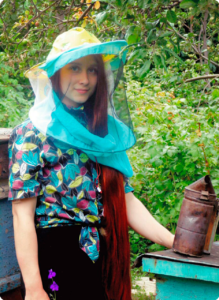 You prevent the transfer of possible infections from other people’s hives to your apiary. 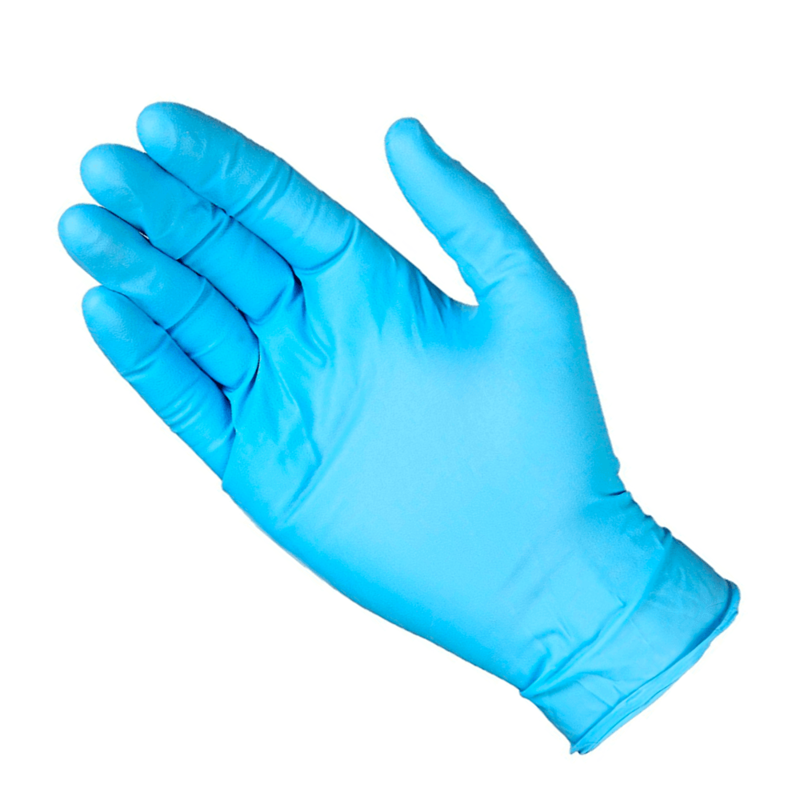 Nitrile gloves provide the greatest sensitivity of fingers compared to any other gloves. You can easily feel the bee, the surface, the temperature, almost like there are no gloves. Ideal for small soiling. It is enough just to wash off the contamination with water or a wet wipe and continue working, while leather gloves become uncomfortable when wet. Poor protection – the gloves themselves do not have any guarantee of protection against stings since they are not intended for these purposes and are not specialized. Can bees sting through rubber gloves? Definitely yes. 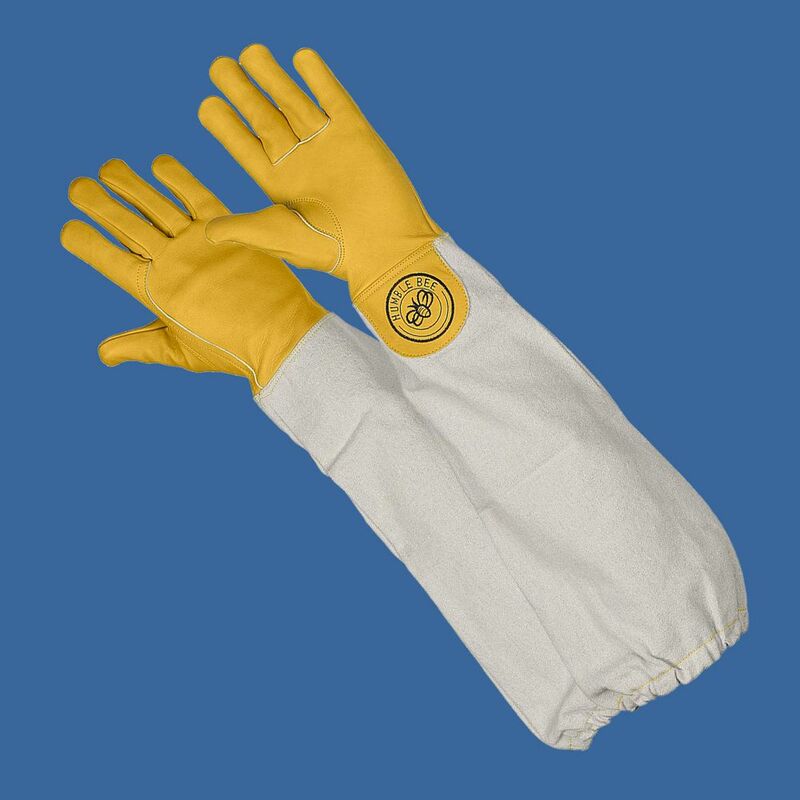 In addition, disposable nitrile gloves are usually very short, and reusable beekeeping gloves have wide and not adjacent sleeves, through which bees can easily fly inside the gloves. If you have a large apiary or you need to inspect a lot of hives, the number of disposable gloves used can be a real problem. Sometimes I had to change up to 5 pairs of gloves a day, besides, they sometimes were torn. Unnatural color and texture. It is very difficult to find rubber gloves in white or yellow. Although, for a quick inspection of the usual blue nitrile gloves are quite suitable. But if leather gloves are perceived by bees as a real beekeeper’s hands (light color; material are the same skin), then bright rubber gloves, as infinitely unnatural, cause increased aggression in them. Hands very quickly sweat in these gloves, as they have no hint of ventilation, even thin beekeeping gloves. Sometimes, if the gloves are a little larger than necessary, they were so slippery from the inside that they had to be removed all the time to dry. This problem applies to both nitrile and washable gloves. At the start, I mentioned that I’ve got a tip for you if you find yourself dealing with an unfriendly colony. All you need it just to have some extra protection – it’s a bit like the leather gauntlet with the nitrile glove over the top of that. It’s called a double gloving. You take your normal one hand on the glove and you simply put another glove over the top. Once you’ve double gloved up one little trick that I can also recommend is just using a little bit of talcum powder in the glove. You can get the glove onto your hand properly. When we are double gloved the bees will find it really difficult to sting through this. For example, if I just fold that back I’ve got the pale blue underneath and then the purple one on top and if you pull that down and then put your gauntlet on that’s going to give you really good protection. You can get through and do an inspection really quickly and deal with bees rather than being constantly stopped and having to pull out strings from the back of your hand. So I hope you find that useful. So, my conclusion about the best beekeeping gloves. If you’re just starting and you go along to a local Association beware the old codger sat in the corner who says you don’t need to wear gloves, they’ve never worn gloves, you just have to put up with being stung and if you wear gloves you’re not a true beekeeper – just ignore what they’re saying. Do what you feel. I’ve had people tell me time and time again that I shouldn’t be wearing gloves and it’s a waste of time, but for me – I like to wear my gloves keep my hands protected and then I can go from colony to colony and at the end of the day I know that I haven’t been dipping my hands into water into washing soda, being covered in propolis and having to scrub it off. Just to summarize – if you’re just starting beekeeping and you wanted to take on some gloves and you weren’t suffering from any kind of allergy I would recommend the blue nitrile gloves. They give you really good protection, you can feel the bees and you can feel exactly what you’re doing. Also, they protect your hand from the washing soda and the cleaning solutions that you might be using. The next step up from that would be the washing up gloves – those have the advantage of being able to be washed so you can use them over and over again until they start to deteriorate. 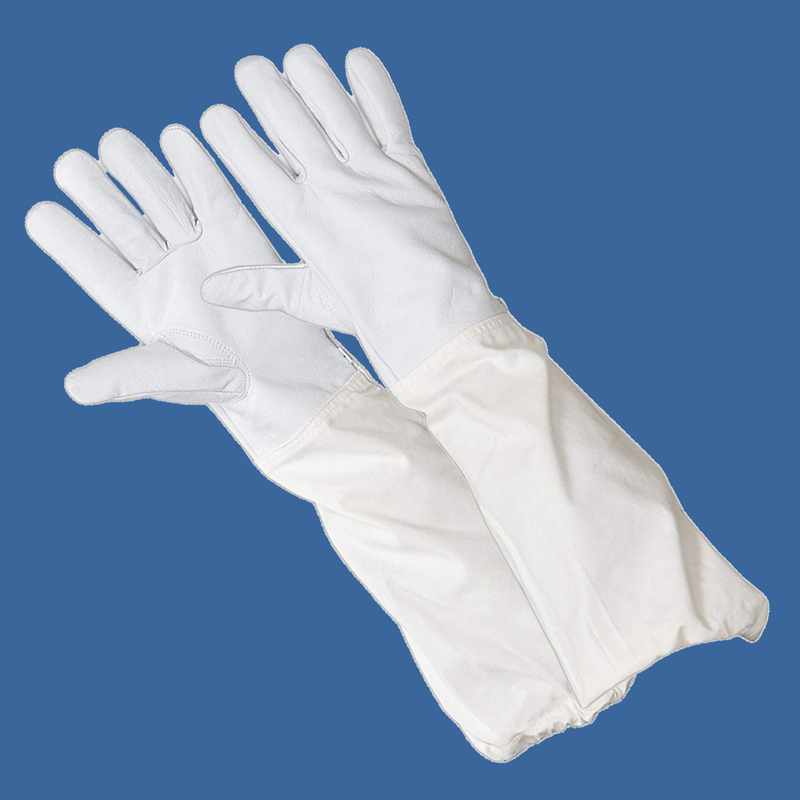 If cost is an issue then the washing-up gloves are a happy medium between having to wear something like the leather gloves and the nitrile gloves. Finally, if you find yourself being really nervous or that you know that you do suffer from allergic reactions then ultimately the leather gloves with the gauntlet attached are going to be the glove to use. Be mindful that there is the issue regarding a transfer of disease and you’re going to have to clean them ideally in between colonies, but certainly in between apiaries. So again it might be worth just double gloving those buy some blue nitrile gloves make sure they’re the long cuff version and use those on top of the leather beekeeping gauntlets. So, each beekeeper chooses it’s own best beekeeping gloves, even glove-free beekeepers. Well, I hope you find that useful! Choosing beekeeping gloves for children, one should think about functionality last of all – most often young beekeepers perform the tasks of the beekeeper “make-believe”, otherwise they are just observers. 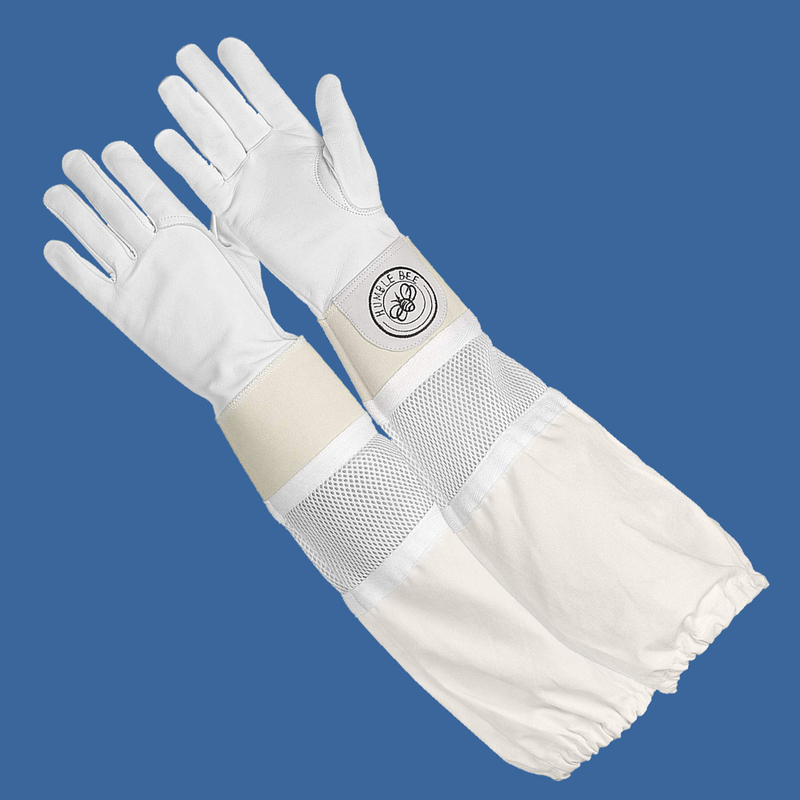 Therefore, when choosing children beekeeping gloves, as a rule, two goals are pursued – first of all, to protect the child from bee stings, and give him the opportunity to feel “as an adult.” Appropriately, externally, the gloves should resemble those that are grown-ups wearing, but at the same time be of child size. I found similar ones from only one manufacturer. It’s amazing how hard for a fragile girl to choose sting proof beekeeping gloves! XS or XXS sizes are represented not by all manufacturers. In this case, I don’t recommend to compromise and buy the smallest size available, even if it is big for you. It is fraught with disappointment and lost money. First, look for those manufacturers who offer XXS size. For example, Humble Bee. Secondly, use goatskin gloves – they stretch better, and they are softer, which is undoubtedly more pleasant for women’s hands. And, of course, don’t forget about the moisturizing hand cream after you have finished working in the apiary and removed the beekeeping gloves. This is especially true on hot summer days. How To Clean Propolis Off Leather Gloves? If you’ve already soiled your beekeeping gloves, don’t wet them and try to put in the freezer for at least an hour on the same day, and better. After the propolis hardens solid, try to gently crumple the gloves – and it will be easy to move the pieces away from them. How to clean beehive gloves in case of small amounts of propolis, wipe the gloves with a napkin with alcohol, but after that, be sure to air or wash them as well. Same is the answer on how to clean goatskin beekeeping gloves, not only cow leather. But it is better to use a special spray for the skin beforehand – it helps the gloves not to shrink and crack, moreover, it partially repels dirt. I’m using a usual goatskin leather cleaner. Verified! In addition, if you have a bee smoker with a leather bellow, then with the help of this spray you will extend its service life. Just to summarize – if you’re just starting beekeeping and you wanted to take on some gloves and you weren’t suffering from any kind of allergy I would recommend the blue nitrile gloves. They give you really good protection, you can feel the bees and you can feel exactly what you’re doing. Also, they protect your hand from the washing soda and the cleaning solutions that you might be using. The next step up from that would be the washing up gloves – those have the advantage of being able to be washed so you can use them over and over again until they start to deteriorate. 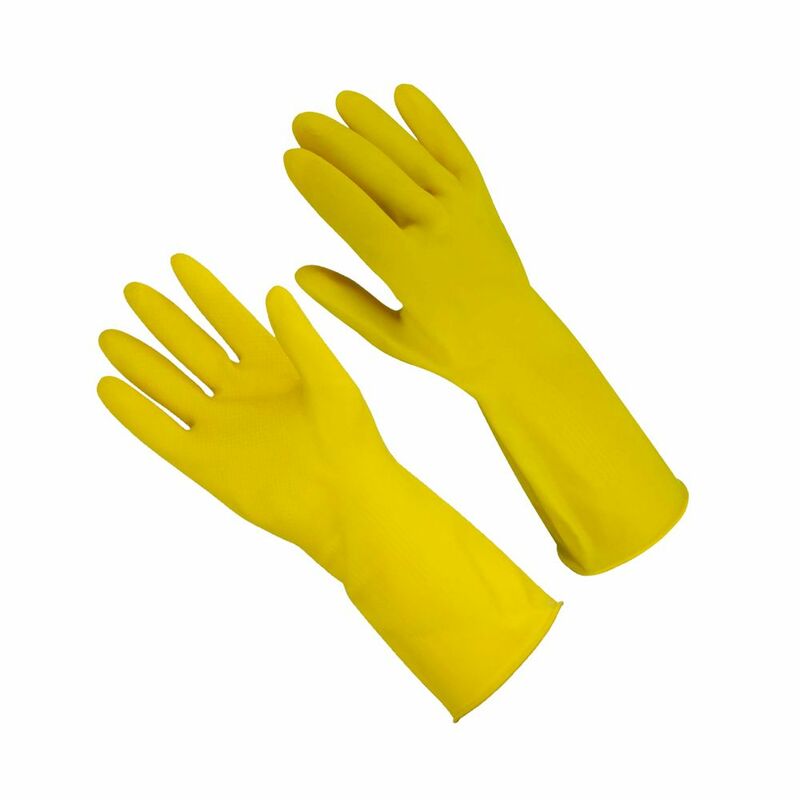 If cost is an issue then the washing-up gloves are a happy medium between having to wear something like the leather gloves and the nitrile gloves. Finally, if you find yourself being really nervous or that you know that you do suffer from allergic reactions then ultimately the leather gloves with the gauntlet attached are going to be the glove to use. Be mindful that there is the issue regarding a transfer of disease and you’re going to have to clean them ideally in between colonies, but certainly in between apiaries. So again it might be worth just double gloving those buy some blue nitrile gloves make sure they’re the long cuff version and use those on top of the leather gauntlets. If you are looking for a complete bee suit – this review may be useful for you – Best Bee Suit. Well, I hope you find that useful!